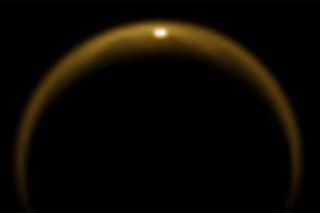 This image, taken by the Cassini spacecraft, shows the first flash of sunlight reflected off a hydrocarbon lake on Saturn's moon Titan. The July 2009 image confirmed the presence of liquid in the moon's northern hemisphere. A new study of eight years of radar data collected by the Saturn-orbiting Cassini spacecraft shows that the planet's largest moon, Titan — the only other body in the solar system besides Earth where liquids pool on the surface — has a sea of pure methane.